Black Diamond Peak, a 7,146 foot peak located in the south-central Dragoon Mountains, doesn't stand out from a distance. It's just another mountain along the crest of the Dragoons. But it delivers an adventure and an incredible view for those who pick their way up its rocky crest. 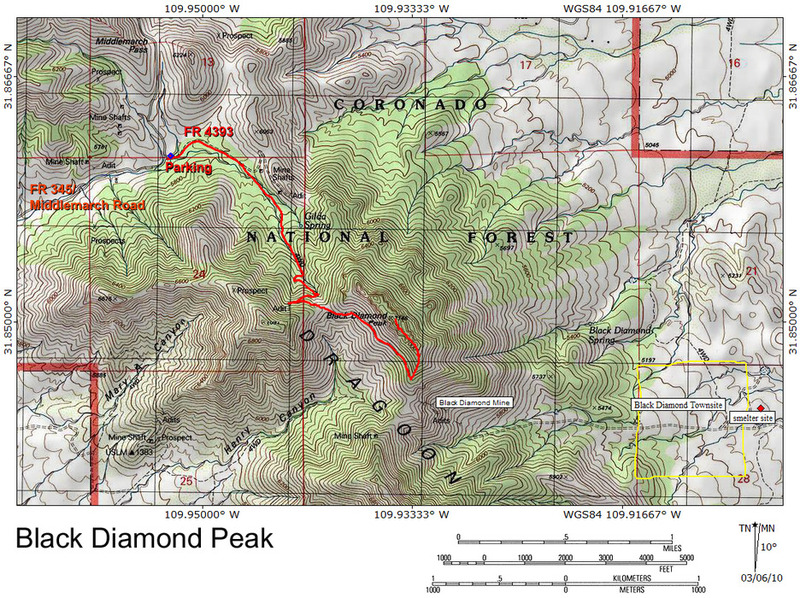 This hike describes a route to the peak from Middlemarch Road. Black Diamond Peak received its name from the Black Diamond Mine, discovered on its southeast slope by prospector Albert George in 1880. The name Black Diamond was a reference to its zinc ore that resembled black diamonds. George worked his claim for several years, before being killed by Apaches at Black Diamond Spring in early 1883. The mine was relocated in 1891 by several businessmen from Tombstone, who, after some exploratory work, uncovered a fortune in copper and silver ore. The mine slowly developed into a major operation in the following years, eventually spawning the town of Black Diamond, a smelter to process the mine's ore, an aerial tramway to haul the ore to the smelter, and several thousand feet of underground tunnels. At one point some two hundred miners were employed, and a hotel and post office were in operation. Lack of water and financial problems continually plagued the operation though, bringing an early end to the mining boom. The Black Diamond Mine changed hands multiple times during the 20th century, and attempts were made to reopen it, but the ore, laced with zinc, was considered too complex to profitably process. A short distance up Forest Road 4393 from Middlemarch Road is a parking area in the trees on the left side of the road. Park here, and stay right at the road fork, which crosses a creek bed. If you have a high clearance vehicle, you can drive farther up the road and park, but turn around spots and parking are limited. Anyhow, start hiking up Forest Road 4393. The road climbs steadily up the valley floor through oak scrub towards Black Diamond Peak, which appears as a rocky topped green pyramid above. A couple of spur roads break off to the left, accessing a small abandoned mine. Our road climbs steeply, aiming for a high saddle to the right (west) of the peak. Be sure to take a break, and turn around to admire the view of the Stronghold behind you. The steep and rocky route of Forest Road 4393 concludes at a "T" junction high on a mountainside, at 1.4 miles. The right spur leads a few hundred feet to the abandoned tunnel of the Escapule Mine. The mine is worth exploring, but be careful. Old shafts drop down from the main tunnel. Back at the "T" junction take the left spur, which is really nothing more than an old bulldozer scar from mining days. A path follows the old bulldozer scar through the pinyons, and soon peters out upon reaching the high saddle on the west side of Black Diamond Peak. The view from the saddle is impressive. One can look out of Henry Canyon's amphitheater to the San Pedro Valley, and along the spine of the southern Dragoons. Above, the rocky bluffs of Black Diamond Peak beckon. From the saddle, a faint game trail follows the faint bulldozer scar across the rocky western slope of the peak, climbing almost imperceptibly. The game trail fades in and out, and it may take some imagination to see the ancient bulldozer scar, but you really won't get lost here. Other than scattered junipers and yuccas, the mountainside is quite open. Just aim for the ridgeline or the saddle on the far end of Black Diamond Peak. A half mile traverse will bring you to the south ridge of Black Diamond Peak. Once you reach the south ridge, start climbing. There is nothing too difficult here, just plenty of weaving through boulders and brush on a steep ridgeline. Hundreds of feet below, the tailings of the Black Diamond Mine are just barely visible. What cannot be missed though is the far reaching view of the Sulphur Springs Valley and the Chiricahua Mountains. The ridgeline eventually transitions into mountain top, and the going gets tougher. Rocky outcrops and pinyon limbs do their best to slow your progress, adding a bit of challenge and fun. After several false summits, you will reach the true summit of Black Diamond Peak, which is a small, bare rocky patch overlooking the rest of the mountaintop. Sign the register, kick back and enjoy the unbeatable, all encompassing view of Cochise County. WEST ACCESS: (recommended) Take US 80 (south) from Benson. Turn left onto Middlemarch Road (one mile north of Tombstone), and follow it for 13.5 miles to Forest Road 4393 on the right. Turn right onto Forest Road 4393, and there is a good parking spot almost immediately, where the road forks. Take the right fork of Forest Road 4393 and start hiking. If you have a high clearance vehicle, you can drive farther up Forest Road 4393, but parking and turnaround spots become limited. EAST ACCESS : (Warning: can get very muddy after wet weather!) From Tucson, take I-10 east to US 191. Turn right (south) and drive approximately 20 miles south to Ghost Town Trail road on the right (just before the highway curves west). Turn right onto Ghost Town Trail and drive 1.1 miles to the 4-way intersection at the old town of Pearce. Turn right onto Pearce Road (Forest Road 345) and continue west, eventually staying left as the road becomes Middlemarch Road (still Forest Road 345). Continue over Middlemarch Pass (highpoint of the road) and arrive at Forest Road 4393 (signed) on the left, about 11.2 miles past the old town of Pearce.